We are a leading Manufacturer of bag closing threads from Indore, India. 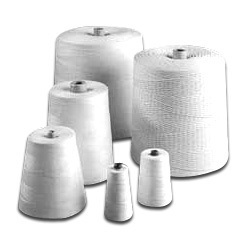 We offer our clients an extensive range of Bag Closing Threads, which is made of premium grade combed cotton, polyester cotton blend, polyester and polypropylene materials. Our range is manufactured using modern machinery and process technology to ensure smooth color and surface finishing. The exclusive range is used in Fertilizer, Sugar, Rice & Flour grinding, Cattle feed, Soap & Detergent, Chemical flakes, Agro, Port operation, Pigment manufacturing, Salt processing, Tea packaging and Milk processing industries. The extensive range of our company is offered in single to complex tricolors and appreciated for zero twisting and knots.